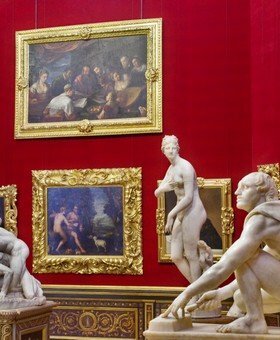 Enjoy beauty with a private tour of the Uffizi Gallery. An expert local guide will show you the masterpieces by Botticelli, Leonardo Da Vinci and Michelangelo. 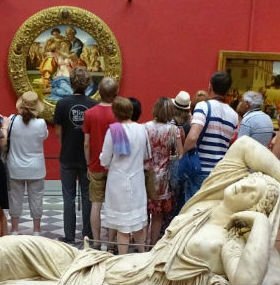 This tour will show you the two most important museums in Florence: the Uffizi Gallery, home of Botticelli’s masterpieces, and the Accademia Gallery, where you will see the original statue of David by Michelangelo. 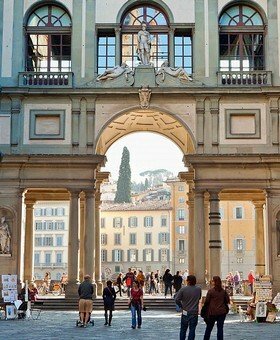 The tour starts in Piazza degli Uffizi for a brief historical introduction to the events that took place in Florence between 1537, when Cosimo de Medici became Duke of Florence, to 1560, when the construction of the Uffizi building started. Then, your expert local guide will collect your tickets and you will enter the Uffizi Gallery to reach the top of the building. You will go through the corridor, decorated with a large collection of ancient Greek and Roman statues, portraits of members of the House of Medici and other important people and beautiful frescoes, visiting the most important rooms, which contain the top collection of paintings in Italy. 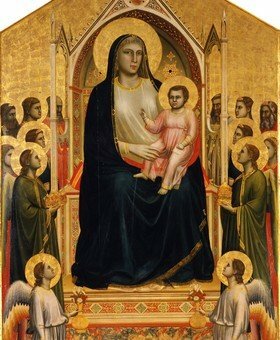 You will start seeing three huge altarpieces, apparently similar, yet very different, understanding how the foundations of the Renaissance were actually built by Giotto, a painter who lived in Florence about one century before the conventional start of the new artistic trend. 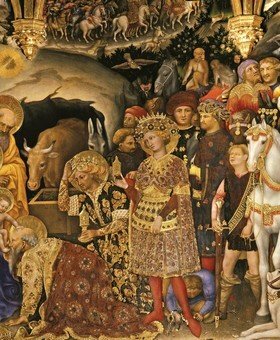 Your guide will show you the Gothic paintings made in the 15th century, already influenced by the early Renaissance works, in particular, the Adoration of the Magi by Gentile da Fabriano, a painting made for one of the incredibly rich families of Florentine merchants. 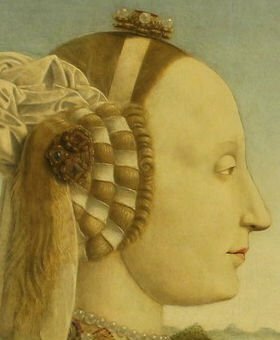 In this period, the early 15th century, the social rank, and consequently the way of thinking of Florentine people, started to drastically change paving the way to the Renaissance. The early Renaissance works look totally different from the late Gothic works, something that probably had never happened so fast in art history. 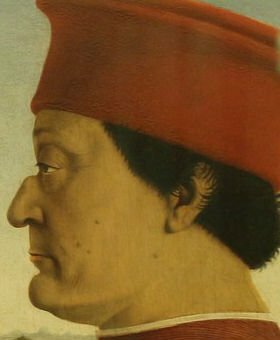 This is visible in the double portrait of the Dukes of Urbino by Piero Della Francesca and in the Madonna and Child by Filippo Lippi, a painter who worked directly for the Medici family, the family of bankers that became the rulers of Florence right in the period represented in these rooms. It’s the next generation of painters (represented in the next rooms) that showed the world a new concept of beauty. 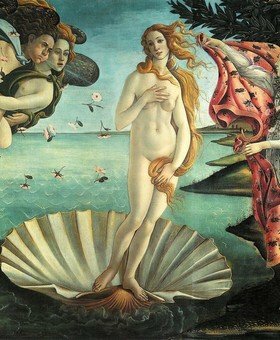 Prepare to be guided in the world of Botticelli, probably the finest interpreter of the re-birth of the European culture, with his famous pagan allegories considered the must-see of the Uffizi Gallery: The Birth of Venus and La Primavera, along with more works by the same painter. 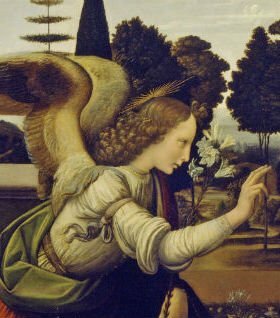 In the next room, you will see the works by the genius of the Renaissance: Leonardo Da Vinci, represented in the Uffizi Gallery with the Annunciation and the Adoration of the Magi (this work is currently away for restoration). It’s finally time to reach the corridor again to see the most amazing room of the museum: the Uffizi Tribune. This late addition to the building (1583) is to be considered the first room used to store the Medici collections, and everything here is a work of art, including the floor. You will now take a look at the views from the windows of the Uffizi Gallery that include Palazzo Vecchio and Brunelleschi’s Dome on one side, The Basilica di San Miniato, the Pitti Palace and Ponte Vecchio on the other side. 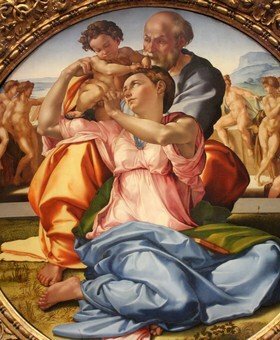 What awaits you in the next room is something you can’t see anywhere else: Michelangelo’s Tondo Doni, the only existing painting on panel referred to the greatest artist ever. You will learn how the master of all arts, even with a single work of this kind, changed the Renaissance forever. It’s finally time for a short break. 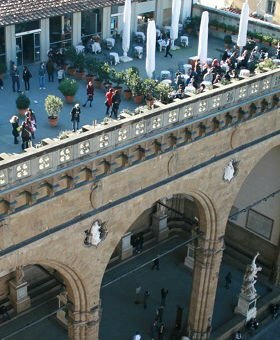 From the Uffizi terrace, you will enjoy a great view of the city and if you want, you can sit at a table and have a coffee, cappuccino or whatever else you prefer (at your expense). Once done, you will follow your guide downstairs to go through the rooms showing the mannerist painters Andrea Del Sarto, Rosso Fiorentino, Pontormo, Bronzino. These great artists are unknown to most people, having been overshadowed by the myth of Michelangelo. Bronzino, in particular, was the official portraitist of Cosimo de Medici. The next room displays the works of another famous Renaissance artist: Raphael Sanzio. Even though he’s not a Florentine painter, he lived in Florence for some years, learning from the masters Da Vinci and Michelangelo and later becoming a direct competitor of Michelangelo in the decoration of the Vatican rooms. It’s time for a digression on the Venetian school of painting. 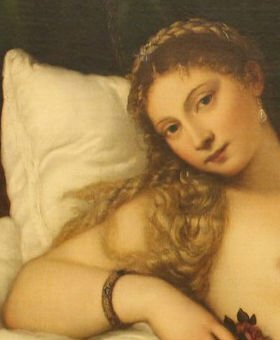 Your guide will show you the room dedicated to Titian, featuring his masterpiece: the Venus of Urbino. The finale of the tour is reserved to the artist who first of all was able to set free from the influence of Michelangelo. Incidentally, Michelangelo was his first name, but he is better known as Caravaggio. 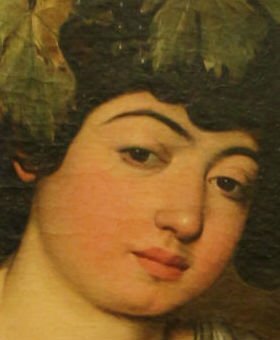 During his short and adventurous life, this painter proposed a new language in advance on times, which was often criticized by the Catholic establishment but appreciated by the Medici dynasty, which, on the verge of decadence, still retained his taste for fine arts and will to evaluate and accept new things, which made them the greatest patrons of arts in history. After leaving the Uffizi Gallery you will walk through Piazza della Signoria and reach the Duomo, that you will see from outside. You will then walk to the Accademia Gallery. The guide will collect your skip-the-line tickets, reserved in advance, and you will get inside to see the most famous statue in the world: Michelangelo’s David. 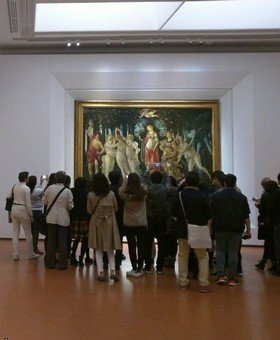 After about four hours of tour, the guide will leave you and you will have a chance to continue exploring the Accademia Gallery on your own or follow the guide outside. If you’re tired, the guide will call a taxi for you to reach your hotel (at your expense). The itinerary is indicative and can be changed in case some room is inaccessible for restoration. Hotel pick-up is available for hotels in central Florence, but consider that the time needed to reach the Uffizi Gallery is included in the four hours: because of this, the time inside the Uffizi Gallery might be reduced. 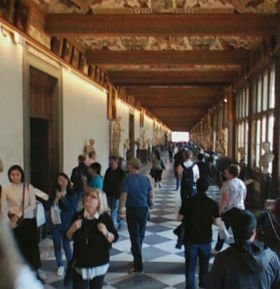 Even with skip-the-line tickets, expect to wait some minutes to enter the Uffizi and Accademia Galleries, especially during high season, because of the metal detector checks that slow down the flow of visitors. In particular, entrance at the Accademia during peak time can be delayed by up to 30 minutes. Your jackets and bags will be scanned by a metal detector at the museum entrances. Knifes, cutters, multipurpose tools and any sharp object that might represent a danger for the works of art will be seized at the sole discretion of the museum personnel. Large backpacks and long umbrellas will have to be left at the entrance and be collected at the exit (this service is free of charge). Even if you cancel this tour in time (at least 7 days in advance), there is a cancellation fee of € 58/adult and € 16/children because entrance tickets are not refundable.